"...a huge hit with our congregation." A beautiful and innovative WordPress theme designed for the best church website. Maranatha is a church WordPress theme designed to help you make a stunning church website easily. Innovative features include a long homepage with parallax-inspired scrolling. Use images or a video background on your homepage. The sticky menu conveniently “sticks” to the top of the screen when scrolling. Special care has been given to every detail of this responsive, mobile-friendly church theme. It sports crisp circular buttons, custom styled maps, excellent readability and real-time customization of your colors, fonts and more. As a full-featured church WordPress theme, Maranatha beautifully presents your sermons as audio, video or text. A compact menu appears at the top of your sermon pages for easy navigation by topic, series, book, speaker and month. The events calendar has features for maps, categories and more. You can create ministries, present staff profiles, share locations and publish a church blog. Other notable features of this church WordPress theme are custom header images and footer widgets. Our guides, videos and one-on-one support make it easy to create your church website using the Maranatha church WordPress theme. We’re here to help from start to finish and beyond. Read Maranatha’s launch post to learn what makes it different and better. Try risk-free with our 45-day money back guarantee. The Church Content plugin is included with Maranatha. You also get access to all of our other church WordPress themes, guides with videos, helpful support and starter website content. 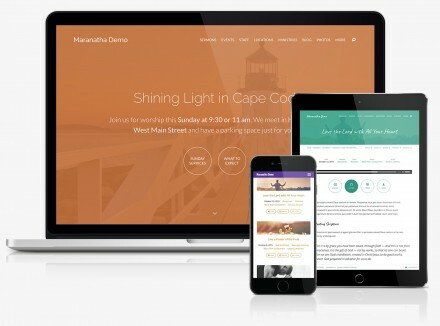 Maranatha has a responsive design optimized for smartphones and tablets. Customize the design's colors, fonts and other elements with a real-time preview. The menu and logo conveniently "stick" to the top of the screen as you scroll. Upload your logo image or use text while choosing a custom font and size. A compact menu specific to each section helps users navigate sermons, events, etc. Easily customize your site's main color and the color for links and buttons. A single content column with carefully chosen width and font size emphasizes content and improves comfort. Choose from a hand-picked selection of Google Fonts ideal for Maranatha. Show images for different sections (e.g. one for sermons, another for events). Custom styling of Google Maps ties them into Maranatha's unique design. A notice bar sticks to the bottom for showing upcoming events, recent sermons or other content of your choosing. Maranatha is optimized for high resolution screens, including Retina®. Drag and drop sections to create a stunning, informative homepage with optional background video. Share audio, video and text sermons. Upload or use YouTube, Vimeo and others. Topics, books, series and speakers. Reach more people by automatically podcasting your sermons on iTunes, Google and other platforms. Display church events in a monthly calendar or list. Show maps with directions and categorize your events. Save time with automatic recurring events and excluded dates (e.g. "every Monday and Thursday except holidays"). Add a single or multiple locations with service times, address with map, directions and photo tour. Show staff and leader profiles with contact details, organizable by group. Create a listing of your ministry pages using the Child Pages template. Publish articles or news on your church's blog. You can setup multiple authors. Nothing beats a WordPress blog. Add photo galleries to any content and upload or add videos from popular sites like YouTube and Vimeo. Attract more visitors with automatic Search Engine Optimization using Schema.org structured data (JSON-LD). Show a map with location details along with widgets for sermons, events, blog posts and more. Great for newsletter sign up. Maranatha fully supports WordPress 5.0 and its new block-based Gutenberg editor. Users can click the search icon in the header to find things on your church site. Get started fast by importing sample content similar to the demo. Our Church Content plugin (included) makes switching themes easy. WordPress and Maranatha are made for regular people — design skill not needed. Get answers to your questions with private, one-on-one support by email. Updates for compatibility, bug fixes and new features with one click. Step-by-step guides with videos walk you through setup and use. A guide is included to help you translate Maranatha into another language. Advanced users can modify the code. Filters and actions abound. This feature is available with our Church Content Pro add-on.